Xtext derives a metamodel from the grammar file by default. For more complex languages it is often better to define the metamodel manually since it allows much more control over the AST, the abstract syntax tree. The metamodel has to be an EMF metamodel, which could be defined in Ecore or Xcore. In this article I will show you the setup to build the model project and how to integrate it into the project build. The Xcore SDK allows to define the metamodel in a DSL which has some advantages against the definition in Ecore. However, using Xcore adds some complexity to the toolchain. Some of these implications are adressed by Holger Schill's presentation "Using Xcore models with Xtext". The presentation also covers the build integration aspect, but with Maven and with the "old" Xtext generator workflows. Nowadays often Gradle is chosen as the build system to use. The new Xtext project wizard introduced with Xtext 2.9 allows to choose Gradle as the build system and produces the necessary build files for the projects. When using Xtext's web integration it is even mandatory at this time to use Gradle. The problem now is that when an Xcore metamodel should be used, there is not much known on how to integrate Xcore in a Gradle build. At GitHub there is a xcore-gradle-example, but this only works with Gradle 2.7 and not with the current version 3.1. Further, it uses the old Xtext gradle plugin and not the new Xtext Builder Plugin. All sources are available in our GitHub repository. Note that the model directory is org.xtext.example.mydsl.model/build/xcore/main. This directory is added as a source folder to the project. The main part is the configuration of the xtext-builder-plugin. EcoreSupport and GenModelSupport have to be added as languages, since they are used by Xcore. For Xcore the producesJava flag has to be set, so that the produced Java classes are compiled and packaged in the resulting jar file. In the sourceSets section .xcore files are excluded from resources. Without that setting Gradle would copy the .xcore file during the build and within Eclipse there would be unwanted duplication errors. In the DSL runtime project we have to make some changes in order to use the metamodel defined with Xcore. Also the generator workflow file GenerateMyDsl.mwe2 has to be changed to use the manually defined metamodel. 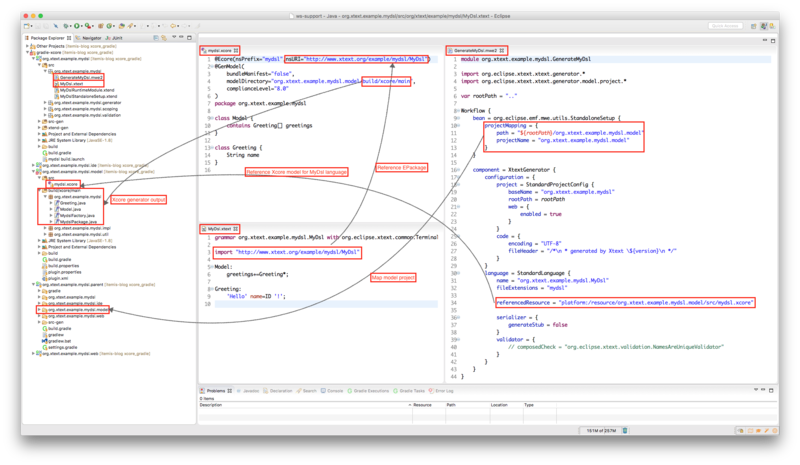 When not using the DSL in the context of an Eclipse plugin, the metamodel's EPackage has to be registered in the EPackage registry. For the case that the metamodel is automatically generated, Xtext takes care of that registration in the generated base class of the DSL's standalone setup class. Using an Xcore metamodel for an Xtext grammar requires an additional subproject which holds the Xcore definition. The article showed the necessary setup to build the model project with Gradle and integrate it into the project build. Some additional changes have to be done to the Xtext grammar to use the predefined metamodel and to integrate it into Xtext's generator workflow, but it's worth the effort especially when it comes to more complex languages. The Gradle build configuration is a bit tricky, but taking this project as a reference it should be mostly copy/paste work. Karsten is a software architect at itemis and part of the Xtext team. He strongly believes that Model Driven Software Development helps to be more efficient in mission critical projects.